← Going Shopping for Lettuce and Leaving with a Cub Salad! 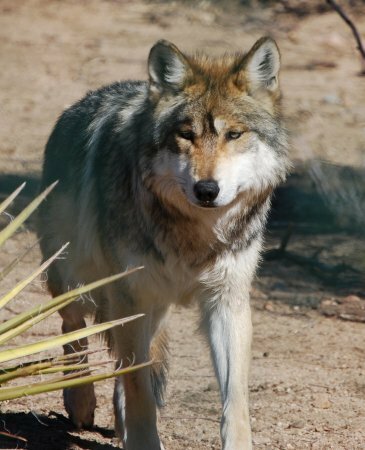 Mexican Grey Wolf back in Mexico for the first time in over 30 years! An exciting step toward restoring a balanced ecosystem to the Mexico/Arizona boarder was reached on Oct. 11th when 5 Mexican Grey Wolves were released back into their native habitat. This is the first time these wolves have been in the Sierra San Luis mountains of northeastern Sonora since they were almost completely wiped out back in the 1970-1980s. IF you can believe it the population of this important species was once down to 5 wolves with only one being a female. Through the cooperation and efforts of Mexican and American conversationalist, they were captured and placed in a breeding program that brought these wolves back from the brink of extinction. In 1998 they were able to release 11 wolves back into the wild for the first time since their original capture. The 11 wolves were release on the Blue Range Wolf Recovery Area near the Arizona and New Mexico boarder. Due to a successful breeding program there are now an estimated 60+ wolves in this area and they are well on their way to establishing a healthy population. Also, there are now 47 breeding facilities in the US that are helping restore the population and are hopeful that the wolves in these facilities are able to eventually be released back into the wild. All of this success has not come without hiccups however. When the wolves were originally released they battled and continue to battle many of the same issues that are being fought today on a larger scale near Yellowstone. Local ranchers and other concerned citizens still have the belief that these animals are pests and many of them do not welcome them back to the ecosystem. Although the battle continues, I’m sure that these wolves will eventually find their rightful place back in the ecosystem that they origianlly thrived in, but until then, we will need to constantly monitor the situation to make sure the re-introduction runs as smoothy as possible. Proper education is a giant part of the success of this re-introduction effort and hopefully this time around science will win over politics. This entry was posted in Education, News and tagged conservation, endangered species, Mexican grey wolf, wildlife, wolf, wolves. Bookmark the permalink.